Vladimir Sofronitzki was born on the 8th of May 1901 in St.Petersburg. His father was a teacher of physics and his mother’s family line included V.Borovikovsky, one of the first Russian painters. In 1903 the Sofronitzki family moved to Warsaw, where Vladimir began piano lessons with A.Lebedeva-Getcevich, and from age nine with Alexander Michalowski. 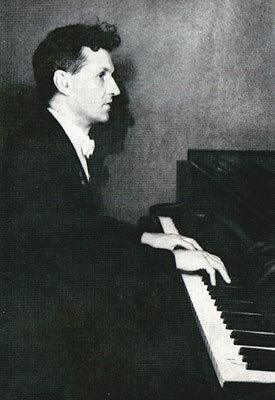 In 1916 Sofronitzki began his studies at the St.Petersburg conservatory with Professor Leonid Nicolaev. In 1919 Sofronitzki gave his first solo concert. In 1920 he married Elena Scriabin, a fellow conservatory student and the oldest daughter of Alexander Skrjabin. He graduated in 1921 and started his concert career. His performances were highly esteemed by Heinrich Neuhaus, Vladimir Horowitz and Egon Petri, as well as by former classmates Maria Yudina and Dmitry Shostakovich. In 1928 Sofronitzki went to Paris via Warsaw, which happened to be his last visit to the city where he had grown up. In Paris Sofronitzki became friends with Sergei Prokofiev and met Nikolai Medtner again. He returned to Russia in 1930 and thereafter only appeared in the West on one occasion, when he was suddenly put on an airplane and sent by Stalin to play at the Potsdam conference in 1945. In 1937 he gave a series of 12 “historical” concerts in Leningrad (formerly St.Petersburg), performing music from Buxtehude to Shostakovich. In 1939 he became a Professor at the Leningrad Conservatory. At the beginning of the Second World War he was trapped in Leningrad, where on 12 December 1941 he played a concert at -3C, wearing gloves with the fingers cut off: “But how I played!” In April 1942 he was evacuated via the “Air Bridge” from starving Leningrad, and brought to Moscow. In 1943 he became a professor at the Moscow conservatory, where he met and later married his student, Valentina Duschinova (Sofronitzki). He played concerts mostly in Moscow, and, after the war, in Leningrad, becoming widely regarded as the best pianist in Russia. Among his many performances, of special note are the cycles dedicated to the anniversary of Chopin’s death, in 1949, and of Schubert’s death, in 1953. Sofronitzki was a highly inspired performer, and each of his performances was regarded as a unique event. He hated recordings and regarded them as “my corpses”, nevertheless his live recordings give a sense of his astonishing musical power. Vladimir Sofronitzki lived in a private world of music and avoided intrigues. Simple and sensitive as a child, he spent a secluded life among his closest friends. Despite his attitude of non-participation - and thus only for his music performances - he was awarded the highest decoration in Russia: The Order of Lenin. Vladimir Sofronitzki led an active concert life until his last years. His last year of concert activity was 1960. His final performance took place on January 9, 1961, in the Small Hall of the Moscow Conservatory. He died from cancer on August 29, 1961.